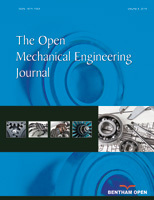 For studying the kinetic characteristics of passive shuttle check valve at the moment that it closes its valve core on the condition of high pressure differences, this paper first constructs the equation of motion of the valve core and twodimensional geometrical model by using computation fluid dynamics method, then with the help of the calculation method and physical model provided by Fluent software, employing the dynamic mesh and user-defined functions, simulates the unsteady flow in the valve core’s closing process under the different pressure fluctuations, and obtains the stress nephogram, the velocity vector diagram, the speed curve, and pressure curve of the interior flow field of the valve. The results show that the bigger the value of valve fluctuation is, the larger the fluid pressure that the valve core is subjected to, the openness of the core and the speed fluctuation of the core are, and that in the case of sudden decompression at the entrance, the core can be shut down quickly with the steady speed field and pressure field. The simulation results are conducive to the design and optimization of structure parameter of shuttle check valve.